Institutional Review Blog: Reform or Revolution? Comment on Bosk, "The New Bureaucracies of Virtue"
Reform or Revolution? Comment on Bosk, "The New Bureaucracies of Virtue"
Following the introduction, the first substantive piece in the PoLAR symposium is Charles L. Bosk, "The New Bureaucracies of Virtue or When Form Fails to Follow Function." Prospective review strikes me as generally one more inane bureaucratic requirement in one more bureaucratic set of procedures, ill-suited to accomplish the goals that it is intended to serve. Prospective review, flawed a process as it is, does not strike me as one social scientists should resist. After all, we agree with its general goals: that our informants should not be subject to untold risks, that they be treated with decency, that their confidentiality and anonymity be safeguarded, when feasible. Given this, we should not waste our energies resisting a process that has an enormous amount of both bureaucratic momentum and social consensus behind it. Instead, we should focus our energies on reforming and revising procedures; we should fix the system where it is broken. Bosk's essay is rich in ideas--too many, really, for an essay of this length. I will do my best to unpack them. Bosk helpfully outlines six elements he finds most common in social science critiques of the IRB system, critiques so numerous that they amount, he writes, to a "chorus of complaint." 1. "The mission creep or bureaucracy run amok complaint: The process of prospective review is unwarranted. There is no convincing evidence that the risks attached to social science research justify it . . .
2. "The inappropriate model argument: Even if what we did was sufficiently risky to warrant prospective review, the model that we are saddled with is so rooted in the model of the biomedical randomized clinical trial that we cannot use it sensibly . . .
3. "The fetish of written consent objection . . .
4. "Journalists are allowed to do what we seek to do without fetters . . .
5. "The chilling effect fear . . . This is a pretty good list, though I think it omits two important elements. First, Bosk writes of the "biomedical model" only as one in which "an empirical risk calculation is available." That overlooks another element of the biomedical model: that risks are better known to the researcher than the subject. That is, an oncologist testing a cancer drug is expected to know much more about the risks of the drug than the subject taking it. By contrast, an informant in an ethnographic study will often know more about the risks of sharing a particular bit of information than does the ethnographer. Second, Bosk's "chilling effect fear" element conflates two separate arguments. One is that ethnographers do not share the physician's duty to do no harm, and should be free to hold individuals, organizations, and communities to account for their behavior. The other, more properly labeled a chilling effect, is that scholars will be deterred from controversial research. These are distinct complaints. The first, for example, complains that IRBs might prevent researchers from studying the police, lest they harm the police--the subjects of their research. The second complains that IRBs might prevent researchers from studying victims of police brutality--claiming to protect the victims, but in effect protecting the police. But Bosk is not satisfied to leave the complaint there. He writes, "the problem with the chorus of complaint is that it fails to explain the organizational logic that enabled, even encouraged, such pernicious 'mission creep' or what to do about it now that it has become an inescapable part of the lived experience of ethnographic research." (200) In the rest of the essay, he addresses those two questions. Whose fault is the problem? Bosk offers two sets of culprits. The first are the IRB administrators who have flourished at research universities. In making this argument, Bosk seems to lean heavily on Caroline Bledsoe et al., "Regulating Creativity: Research and Survival in the IRB Iron Cage." I don't get the sense that he has done any original research into university IRB offices and the trans-university organizations (PRIM&R, AAHRPP, etc.) that drive them. That's a pity, because more work could be done there. Oddly, having argued that real power lies with the "functionaries," Bosk goes on to write that "we seem to forget that those who serve on IRBs are our colleagues, that their service spares us unwanted burdens, and that they deserve a civil dialogue." (205) That is hard to square with his argument that the real problems in prospective review come from administrators who--in effect--are not our colleagues, whose work creates unnecessary burdens, and whose "niggling" concern over typography does not constitute a civil dialogue. More active than what? The current IRB regime dates back only to 1998, and the OPRR crackdown against several research universities. In November 1999 and May 2000, the American Association of University Professors met with representatives of the American Anthropological Association, the American Historical Association, the American Political Science Association, the American Sociological Association, the Oral History Association, and the Organization of American Historians, after which the AAUP produced its 2000 report, "Institutional Review Boards and Social Science Research." In April 2000, Murray Wax outlined many of the standard arguments Bosk cites, testifying to the National Bioethics Advisory Commission that "the gravest ethical problem facing the people studied by anthropological research is posed by unknowing and overzealous IRB's and by governmental regulators attempting to force qualitative ethnographic studies into a biomedical mold." This is not to say that ethnographers did all they could to fight IRB oversight. But it's not clear from Bosk's essay that he is familiar to the resistance going back to 1966. Bosk's real grievance with the chorus of complaint is not that it is inaccurate, but that "the problem with complaint, the undeniable compensatory charm that a sputtering public moral outrage provides notwithstanding, is that it does not create a viable alternative to the status quo." (200) Perhaps, but Bosk is less clear than many choristers about his own ideas for reform. 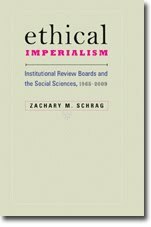 In particular, I could not determine from his essay if he still believes, as he did in 2004, that social scientists should accept prospective review, or if he now seeks to free them from IRB jurisdiction. Parts of the present essay suggest that Bosk still seeks accommodation, as when he suggests that the problems with IRBs are so small that they "might be remedied by educating better IRB members about the nature of qualitative methods or of the regulations themselves." (206) But when he writes of flaws "inherent" and "embedded" in the present regime, that suggests a wish for exclusion. Does Bosk endorse the AAUP's 2006 recommendation that "research on autonomous adults whose methodology consists entirely in collecting data by surveys, conducting interviews, or observing behavior in public places, be exempt from the requirement of IRB review—straightforwardly exempt, with no provisos, and no requirement of IRB approval of the exemption"? I can't tell. This leaves open some important questions. First, what makes an effective narrative? Bosk's own essay begins with two anecdotes, one of which hinges on the very fetishization of written consent that Bosk identifies as one of the elements of the "chorus of complaint." But the anecdote, while attributable to the University of Pennsylvania, bears no date or student name. As Bosk probably understands (though he doesn't say so here), it takes some courage for a researcher, especially a student, to come forward with complaints about powerful figures in one's own university. But without specifics, the narrative may lack authority. Does Bosk's anecdote meet Bosk's own standards? Second, how many narratives do we need? We don't lack for them; follow the links on this blog, and you'll find dozens. The August 2005 issue of the Journal of Applied Communication Research alone contains twenty anonymous narratives along with several signed articles. Will a hundred narratives do more work than fifty? Third, and most importantly, whom are these narratives intended to persuade? If we believe Bosk's claim that the real power lies in the hands of functionaries who value the forms of bureaucracy more than the function of research ethics, then no number of complaining narratives is likely to change anything. And if we believe that power lies in the hands of well-meaning but ignorant IRB members, then the current chorus of complaint should be sufficient to alert them to the problems of prospective review. Bosk paraphrases Marx to say that "the point . . . is not simply to complain about the world but to change it." (196) But his call for more narratives is more a means to amplify the chorus of complaints than to effect change itself. The chorus of complaint has, in fact, suggested several alternatives to the current regime. Bosk has not.